The Art of Teabag Folding. Teabag folding is a form of the Japanese art of origami. It was developed in 1992 by Tiny van der Plas. 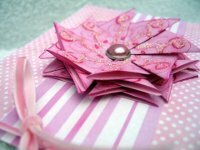 The technique is to make folds in small squares of paper, that are then interlocked together to create a three dimensional image. The papers all need to be square and of equal size, with the same pattern repeated on each square. When the papers are folded they produce a symmetrical and lovely image. Popular designs are flowers, birds and butterflies. 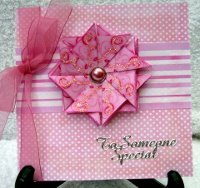 The basic kite fold produces a rosette and these can be used to adorn your cards in a very unusual way. Eight squares of matching paper are needed to make the rosette, which are then linked together and glued into place. They make excellent toppers for cards. There are many different folds and designs around and only your imagination limits you. The swirls on this card have been sparkled up, with my ever favourite Glamour dust. 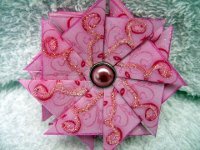 They are very easy to make and look quite spectacular when raised up from the card. The hole in the centre can be filled with a brad, as this one is. Use a gemstone, paper flower or a silver spacer and a charm. All will add to the magical effect! Teabag Flower Tutorial Will give you a visual aid on how to make the flower.